Founded in 1929 as the charter chapter in North Carolina, the Charlotte Junior Chamber, also known as the “Charlotte Jaycees,” have been instrumental in the development of the community and have initiated throughout the years many projects that continue today. Many of Charlotte’s civic and political leaders came from the ranks of the Charlotte Junior Chamber. The charter president was Linn D. Garibaldi. The first big project undertaken by the chapter was to handle the transportation for the Confederate War Veterans Reunion that was held in Charlotte in late June of 1929. The Jaycees used a fleet of 200 private cars and 100 buses for providing transportation for the ten thousand Confederate Veterans during their reunion. 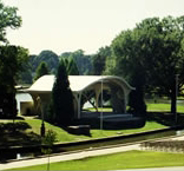 The Charlotte Jaycees spearheaded the drive that culminated in the building of the band shell at Freedom Park, named the “The Alan Newcomb Memorial Park Shell.” They conducted the bond campaign to build Douglas Airport and later to extend the runways. The club conducted public hearings on the feasibility of the Ovens Auditorium – Coliseum complex. Over the years, the Charlotte Jaycees ran the Miss North Carolina pageant. They started the Goodwill Bundle Pick-Up Day in cooperation with the Goodwill Industries. The club worked closely with the March of Dimes on the Walk-A-Thon (and still does today). The Toys for Tots program was initiated in 1960. The Jaycees worked in the area of safety and public health. They conducted fire prevention programs, a Traffic Safety project, and received the first place award from the National Jaycees for Public Health and Public Education in 1948 for a city-wide “Hipboot” inspection of slum conditions. The Charlotte Jaycees have been active in junior sports activities. City junior golf and tennis tournaments have been held. In 1958 the Jr. Olympic Swim Meet had 511 participants. In 1976, a Braille Rally for blind students was organized with great success. In 1955, the club presented the first major basketball games in the “new” coliseum (now Bojangles Arena), a game featuring Georgia Tech vs. University of North Carolina. In 1977, this tradition continued with the Charlottes hosting the First Union Invitational at the Coliseum. During many Christmas seasons, the Jaycees collected food, furniture and clothing for needy families. Special programs are conducted for the entertaining of the elderly and handicapped, such as baseball outings and picnics. The Charlotte Jaycees helped construct a special playground for the physically handicapped children at the St. Marks Center. In the 80’s, the Charlotte Jaycees began hosting the Hugh O’Brian youth Leadership Seminar. This three-day session inspired selected high school sophomores from throughout North Carolina to focus on America’s incentive system. The annual haunted house project continued to be one of Charlotte’s main Halloween attraction and a major fundraiser for the chapter up unto 2005. In July 1984, a Supreme Court ruling opened the doors for women to join Jaycee chapters. Jaycettes and Jaycee Women organizations disbanded in favor of becoming Jaycees. The Charlotte Jaycees benefitted by the admittance of women as membership grew and more projects could be done to benefit the community. Hurricane Hugo blew through Charlotte in 1989 leaving much destruction in its path. The high winds destroyed much of Lakewood Park. In the mind 90’s the Charlotte Jaycees worked to remove debris and broken trees to redevelop the inner city park. Over the past decade, the Charlotte Jaycees continue to run projects aimed at both helping the community, as well as developing leaders. The annual “Ten Outstanding Young Charlottean’s Banquet” honors community members for their service to Charlotte, while also raising funds for charity. The Charlotte Jaycees team with East Coast Entertainment to sponsor the Thursday night “Center City Live After Five” concerts in uptown Charlotte. Over the past 80 years, the Charlotte Jaycees has been an integral part in making Charlotte a better place to live. We will continue to help the community as we develop leaders from within our chapter. We believe that faith in God gives meaning and purpose to human life; that the brotherhood of man transcends the sovereignty of nations; that economic justice can best be won by free men through free enterprise; that government should be of laws rather than of men; that earth’s greatest treasure lies in human personality; and that service to humanity is the best work of life.